Confession: this post is pretty much my reaction to seeing this movie for the first time, since I'd never actually seen it before yesterday. I wasn't sure what to expect, having heard mixed opinions about it. 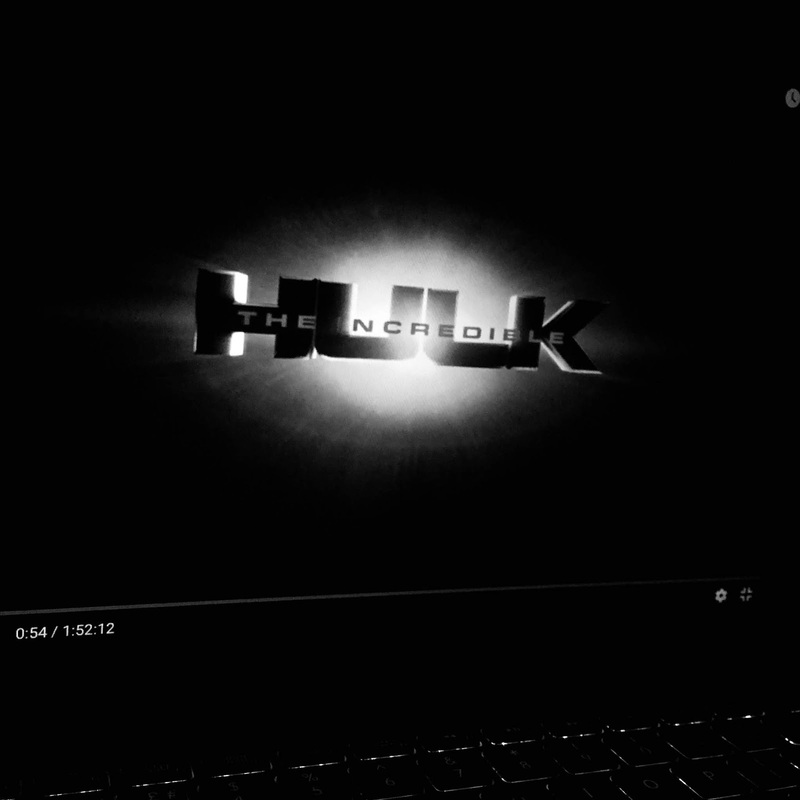 I'm not entirely sure why I put off watching this film for so long - maybe it's for the simple reason that I missed it while it was in cinemas and later got so used to Mark Ruffalo as the Hulk that I figured it wasn't worth going back to watch this one - but I'm glad that I've finally watched it, although it's not what I expected from a Marvel movie. Something about the colour palette and the distinct lack of comic relief makes it feel more detached from the rest of the cinematic universe, so much so that I was surprised at the references to Stark Industries and at the appearance of Tony Stark himself at the end of the film. The colour grading makes it look like a film from the Transformers film franchise, honestly. At least, that was a thought that ran through my head while watching this movie. However, the fact that there aren't very many funny moments makes the one joke that I remember really stand out among the rest of the film. For reference, it's the moment when Bruce and Betty jump out of a cab, Betty yelling at the driver for his dangerous driving, and Bruce tells her that he knows plenty of methods that could help her deal with her anger. It's an obvious joke, but it caught me off guard and made me laugh because the rest of the movie is so dark and dismal. As with plenty of other films in the MCU, the main character is the most interesting part of it all. Bruce Banner is a complicated character, and while I'm more used to seeing him played by friendly-faced Mark Ruffalo, Edward Norton still brings him to life as a likeable character who finds himself in a 'Jekyll & Hyde'-type situation. Maybe that's why it feels so different to the other films in the MCU: while other main characters are busy saving the world from bad guys in their separate films, Bruce is trying to protect the world from himself. Through the eyes of other characters in the film, HE could be seen as the bad guy. The scene in which Bruce first turns into the Hulk is so dark that you don't see the big green monster for a full five minutes, only the destruction that he causes, which made me wonder if the film was trying to borrow tropes from the horror genre, trying to keep the monster as shrouded in mystery as possible before the big reveal. Bruce is a tortured man who wants to find a cure for his condition so he can protect others. He's selfless and caring, plus he's desperate to believe that he and the Hulk are two different entities. He can't bear the idea that he has to control the immense power that is contained within him, and wants to get rid of it so that he can't put others at risk. Of course, he's far from the bad guy, as we learn from this film and from the ones that follow, but there's no denying that you wouldn't want to take him on when he's angry. And this film wins points with me because I'm a sucker for a big loud character who can be calmed down only by one specific person, and each time that I watched Betty successfully calm down the Hulk, I couldn't help but smile a little. But right from the get-go, this movie has its issues. Bruce's entire backstory is reduced to a quick montage in the opening credits, a montage that almost made me say aloud to myself, 'Whoa, slow down.' And I know that this is because there was also a Hulk movie in 2003 that tells this part of the story, but it just feels out of place in this cinematic universe. If you're only watching the MCU films, you're going to feel like you've missed some context. The film suffers from weird pacing all the way through: at about fifty minutes in, I could have sworn that I was already 75% of the way through the film, judging by how much stuff had already happened. It almost feels like the film could have been simplified down to Bruce Banner's battle with his own condition, as opposed to him also trying to escape from the U.S. Government. There's just slightly too much going on, considering the fact that it's not a long film. And the thing that makes it feel VERY detached from the MCU? NO POST-CREDITS SCENE!